In 1975 when this exhibition was first proposed it seemed absurd to suggest that a farmer and engineer like Yeomans could be regarded as an artist. So absurd in fact that the Art Gallery of NSW Trustees intervened to cancel the exhibition on the basis that it wasn’t art. In 2013, the idea is not only understandable enough to make the exhibition possible, but it’s also been quite easy to find a number of artists who use farming, food gathering and systems-design, not only as the subject of their work, but also as their media. From the beginning, Yeomans’ ideas were being extended into other activities. In the 1960s his son Neville used the underlying principles of Keyline in his psychiatric practice, developing a revolutionary contextual approach that treated psychiatric disease on a family and community basis, instead of treating just the individual. At the time Neville was vilified for being out of step with the psychiatric mainstream. 40 years later, his approach to psychiatric treatment has become the norm rather than the exception. But that’s not all. The social ecology theories of Professor Stuart Hill, which we have outlined in one of our prints, envelope Yeomans’ principles. 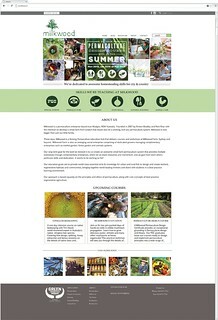 And permaculture, the Australian farming and gardening technique that has now spread worldwide, had its roots in Yeomans’ work. It was inevitable therefore that artists would be attracted to the elegance of Keyline ideas and practice. Rix Wright, the son of the painter Hilda Rix Nicholas, completely restructured his family property “Knockalong” (near the NSW-Victoria border) according to Keyline principles. It was this example that provided AGNSW curator Daniel Thomas with an insight into my 1975 proposal. And although I never succeeded in curating an exhibition of Yeomans’ work in exactly the way that a conventional contemporary artist would be presented, in the decades since then many artists have come to recognise farming and food production systems as their artmaking media. Take Milkwood Permaculture, for instance. Set up by Kirsten Bradley and Nick Ritar (previously working as video and multi-media artists), Milkwood is not only a family farm run on Keyline and permaculture principles, it is also an educational hub engaging dozens of niche practitioners. Milkwood is an ongoing experiment in designing farming and rural living techniques of the future. On a completely different scale, Artist as Family document their various investigations of living a life of slow and frugal abundance in a peri-urban environment, without the resources that most of us consume so wastefully. Their radical redesign of their own family living situation, carried out as an artwork, is another snapshot of the future. 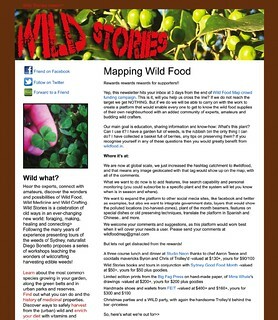 Diego Bonetto, whose “Weedy Connections” and “Wild Stories” have for more than a decade taught us the value of weeds and other overlooked gourmet foods and botanical medicines, is now creating web based applications to help us locate, celebrate and preserve alternative food resources. 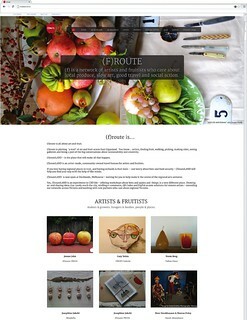 And (f)route is a social enterprise developing, packaging and marketing a trail of foraged fruit as a tourist experience. Combining exploration and foraging, food and accommodation into art tours and camps is also a model with a future. 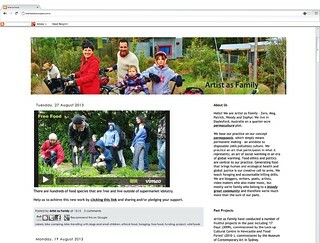 …we’ll be posting about a number of other artists’ agri-projects on our blog during this exhibition. This entry was posted in Art, Farming, History, Permaculture, Sustainable agriculture and tagged (f)route, Artist As Family, Diego Bonetto, milkwood, Permaculture. Bookmark the permalink. Post a comment or leave a trackback: Trackback URL.